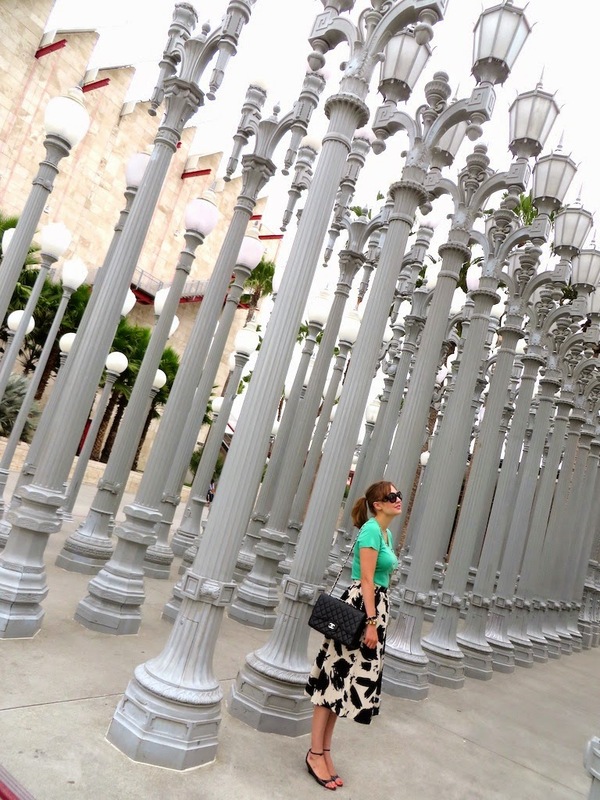 The "Urban Light" sculpture which guards the entrance to LACMA draws people to it like a magnet. Kids stop and play, some sit down to people watch, while others, such as myself, take photos amidst the towering street lamps from the 20s and 30s. I guess the ability to draw the attention and fascination of spectators should be the mark of a successful pubic art work, if this is the case then "Urban Lights" is a resounding success. 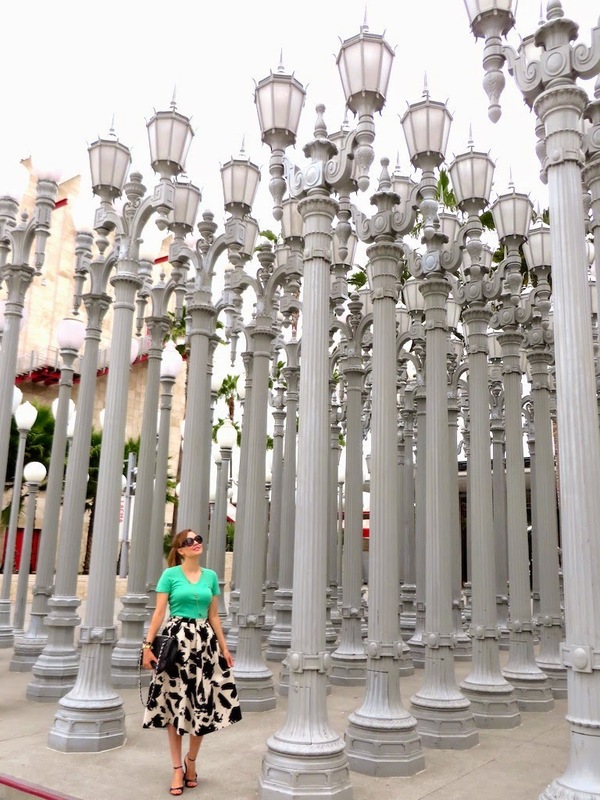 This week my husband and I ventured to the Westside of Los Angeles to take a gander at some of the new exhibits at LACMA. I thought such an occasion should call for an artistically inspired skirt, such as this midi skirt from H&M featuring broad, bold brushstrokes. I like any article of clothing with paint splatters, brushstrokes or some sort of art influence, so this skirt definitely caught my eye. In fact, I liked it so much that when they didn't have it in my size I had my tailor make it just right for me. I guess for many reasons you can say I have some of the "artistic temperament" in me. This winter I also visited the LACMA and its Diane von Furstenberg exhibit in my Museum Leftovers and Journey of the Dress posts. 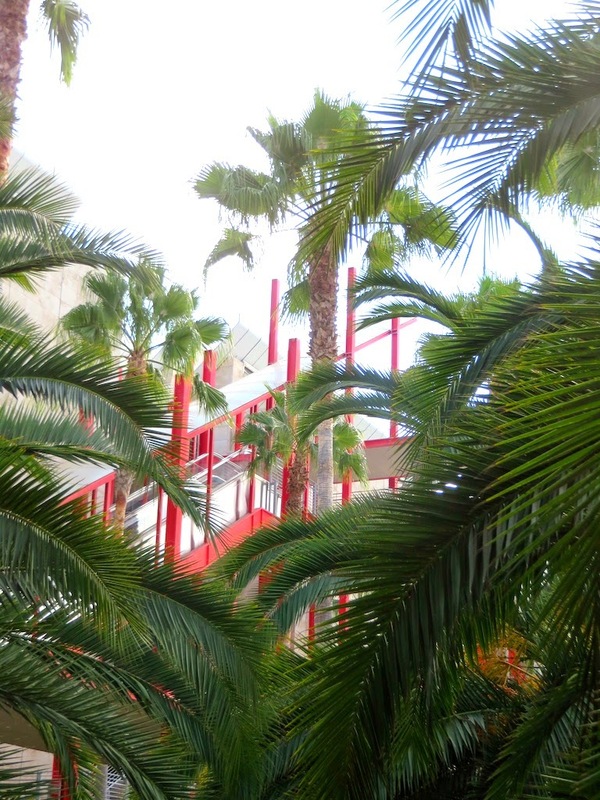 Below you will find a few more fun tidbits from my summer adventure at the LACMA. There are all sorts of fun geometrical structures on which to "play". 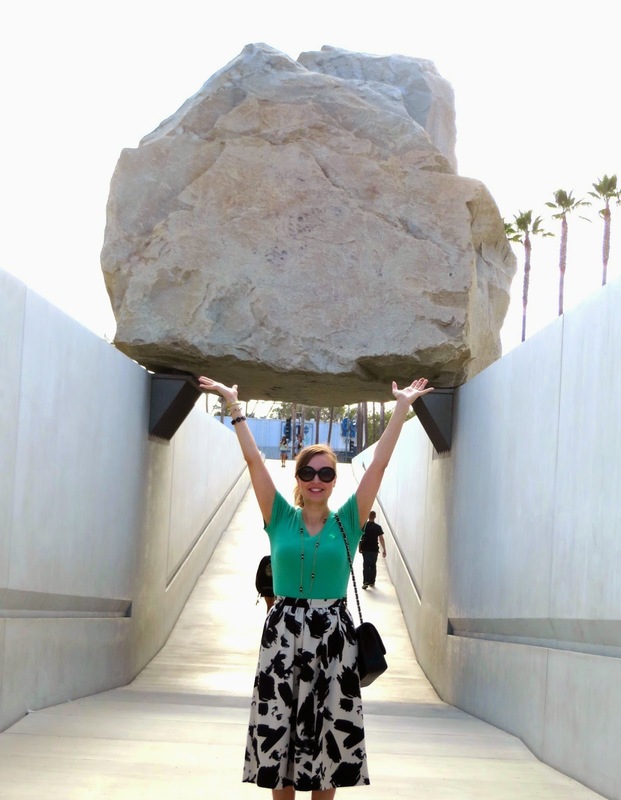 The newest addition to the LACMA is the "Levitated Mass" sculpture which is essentially a boulder suspended over a trench/walkway. It's certainly fun to walk under, but I wouldn't want to be there when the next big earthquake hits! Such a cute skirt! Looks expensive! Thanks Felicia! I love that H&M is able to make affordable items that look more expensive than they actually are. What amazing photos! Adorable look! Thank you Dawn! I love the LACMA. It's such a fun place to go look at art and also take some pictures. Katie, this might be one of my favorite outfits that you've posted. That skirt is so gorgeous - did you get it recently? Thanks! I actually bought the skirt in March. I think it pretty much sold out the day it was released on the website and I never saw it in stores. I guess it was pretty popular. In fact, after I bought it I saw that it was featured in Vogue. I think some sellers on eBay have it, but they charge double what it retails for. It was cheaper for me to buy it in the wrong size and have my tailor customize it as opposed to purchasing it on eBay. As you can see, I really wanted this skirt too! I"m wondering the same thing as Laura. I want that skirt. . . maybe a trip to H&M is in order soon. I felt the same way when I saw it. I thought, "This skirt was made for me!" As I told Laura, I purchased the skirt in March and at that time they were pretty much sold out of it. I'm not sure that the stores would have it anymore, in fact I never saw it or the dress version in my local H&M. It would be worth a try to check eBay. They had quite a few for sale there a couple of months ago. Good luck! Such a fun photo location, and I love that skirt! Thanks Tara! LACMA has so many fun places to take photos. It's also a great museum, one of my favorites in Los Angeles. I can't wait to see how you style this skirt! I'm glad you were able to get it as a pop back in your size. This skirt is definitely worth all of the work!